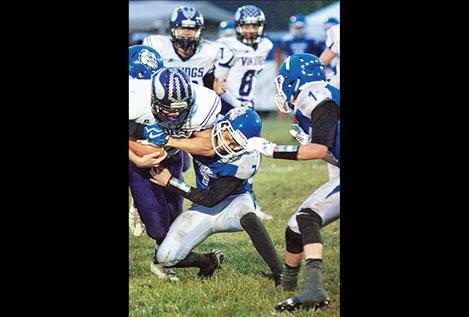 Vikings’ Brock Tomlin blitzes the Warrior quarterback. CHARLO – Short weeks in the collegiate and NFL football season are not uncommon. High school teams often get them too. 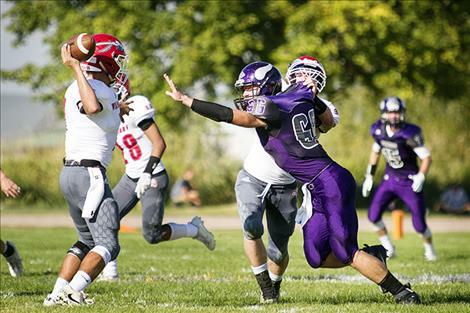 For the Charlo Vikings, the number of days between games against cross-county and conference rivals Arlee Warriors and Mission Bulldogs was only three days, compared to the established routine of one Friday to the next. 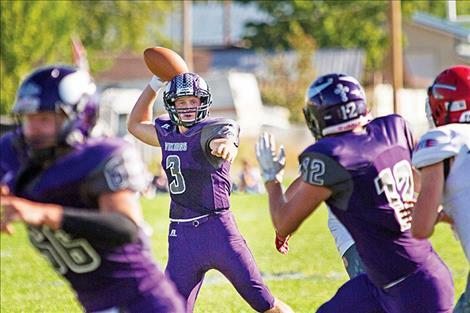 When wildfire smoke pushed air quality to “unhealthy” levels on Sept. 8, it put a big dent in the routine and prompted the Vikings to reschedule the much-anticipated homecoming showdown between the Arlee Warriors from Friday night to Monday afternoon, Sept. 10. On Monday, the Vikings started the game by putting together an eight-play drive resulting in a touchdown to take an early 8-0 lead over the Warriors. The Warriors responded with their own ten-play drive which ended with the first of three Garett Vaughan interceptions. The Vikings went on to score twice more in the first quarter to give them a 28-0 lead going into the second quarter. Though the Warriors’ tough defense seemed to slow down Charlo’s offense, the Vikings went on to score two more touchdowns in the second quarter to take a 36-0 half-time lead into the locker room. 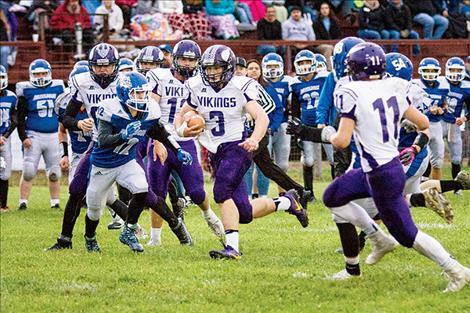 At the start of the third quarter, Viking Brady Fryberger intercepted the Warriors’ quarterback throw and ran it back 26-yards for a touchdown. The Vikings finished the third-quarter with a 50-0 lead. In the fourth quarter, the Warriors put points on the board with a 20-yard touchdown pass but it wasn’t enough. 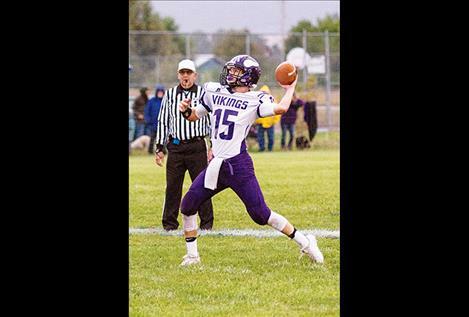 Viking Roper Edwards capped a six-play drive with a 15-yard touchdown pass to Dominic Marquez to end the game 56-6. Friday’s road game in St. Ignatius started out with the Vikings jumping out to a quick 14-0 lead over the Mission Bulldogs. The Bulldogs cut the Vikings lead to 14-6 on their second possession of the game with Gus Bosley’s 47-yard touchdown run. Charlo went on to score again in the first quarter to extend their lead 22-6. Once again, Bosley and the Bulldogs responded with a rushing touchdown to bring the score to 22-14. The Vikings finished the first quarter 30-14 on a Landers Smith five-yard touchdown run. The second quarter saw both offenses struggle to move the ball against each other’s physical defenses. The Vikings were able to tack on a touchdown in the waning moments of the second quarter to take a 36-14 half-time lead. The Viking defense held the Bulldogs scoreless in the second half while the offense scored two more touchdowns in the third quarter to finish out the game 52-14. The Vikings are on the road Sept. 30 at Plains.